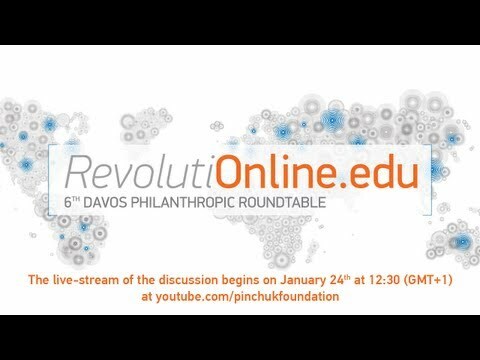 6th Davos Philanthropic Roundtable "RevolutiOnline.edu - Online Education Changing the World"
On Thursday, 24 January, 2013 at 12:30 (GMT+1) in Davos (Switzerland) at the Morosani Schweizerhof Hotel the Victor Pinchuk Foundation held its 6th Davos Philanthropic Roundtable "RevolutiOnline.edu - Online Education Changing the World" on the occasion of the Annual Meeting of the World Economic Forum.The panel brought together Thomas Friedman, Foreign Affairs columnist, The New York Times (moderator); Bill Gates, Co-Chair, Bill & Melinda Gates Foundation; Rafael Reif, President, MIT; Larry Summers, President Emeritus, Harvard University; Daphne Koller, Co-Founder and Co-CEO, Coursera; Sebastian Thrun, Founder, Udacity; Peter Thiel, Partner, Founders Fund and Jimmy Wales, Founder, Wikipedia.Speakers and participants discussed the strategies that philanthropists are using to expand and accelerate online education to give millions of people access to high level education and the chance to a better life. Online education will change educational institutions, the nature of education, and access to education radically. The discussion will also focus on how philanthropic resources and technology are being integrated to foster this growing revolution in education.About 300 leaders from the fields of philanthropy, business, politics and media attended the event.The Philanthropic Roundtable is organized each year at the occasion of the Annual Meeting of the World Economic Forum to bring together the world's most renowned philanthropists and leaders from politics, the business community and the non-profit sector. Roundtable discussions address state-of-the-art approaches to problem-solving and seek to inspire the new global philanthropists of the future.Since 2007, Roundtable panelists have included, among others, Tony Blair, Sir Richard Branson, Bill Clinton, Bill and Melinda Gates, Jet Li, Shimon Peres, Muhammad Yunus, H.E. Sheikha Al Mayassa bint Hamad bin Khalifa Al-Thani, Paulo Coelho, Sean Parker, Eric Schmidt, Alec Ross and others.The 6th Davos Philanthropic Roundtable Telco Partner is Kyivstar.